One of the planet’s largest collections of DNA samples – a genetic Noah’s ark held at the University of Guelph representing Canadian creatures from mites to whales — will be made available starting today to researchers worldwide under an international biodiversity project. Throwing open the doors to a massive genetic archive at U of G’s Centre for Biodiversity Genomics (CBG) will provide online access to sample information for universities, government agencies and industry that may help researchers pursue projects ranging from human health to biodiversity, said Jeremy deWaard, the centre’s associate director of collections. Now those genetic extracts representing 65,000 species of organisms collected across Canada over the past 15 years will be made available through the Global Genome Biodiversity Network (GGBN), a grouping of institutions holding DNA and tissue samples from around the world. The consortium is headed by the Smithsonian Institution in Washington, D.C.
Users worldwide may search a new public database for all 1.5 million Canadian extracts held at U of G, and request samples to be delivered from the archive, said deWaard. Researchers might use the resource for varied projects from looking at population genetics of mosquitoes carrying pathogens, to learning about host-parasite interactions, to examining DNA and proteins in insect toxins for potential health applications. U of G’s DNA collection covers about two-thirds of the estimated number of species of animals in Canada, including insects and other invertebrates. “That’s the bulk of life in Canada,” said deWaard. Those Canadian samples are among more than 5.3 million DNA extracts from creatures collected worldwide and stored in the archive under U of G’s DNA barcoding project to catalogue life on the planet. That genetic resource is “the largest single collection of DNA on Earth,” said Jonathan Coddington, director of the Smithsonian-based Global Genome Initiative (GGI). The GGI is a six-year project begun in 2013 to preserve and understand the genomic diversity of life. It supports the Global Genome Biodiversity Network, which now numbers 71 centres in 24 countries. U of G joined the project in 2017 – a key development for the network and the wider project, said Coddington. Each sample is linked to its DNA barcode, a short sequence of genetic material used to identify and differentiate species of organisms. Pioneered in 2003 by integrative biologist Paul Hebert, DNA barcoding has enabled researchers around the globe to catalogue small snippets of genetic material from millions of specimens. That resource is used in species conservation, food safety, environmental monitoring and other applications. 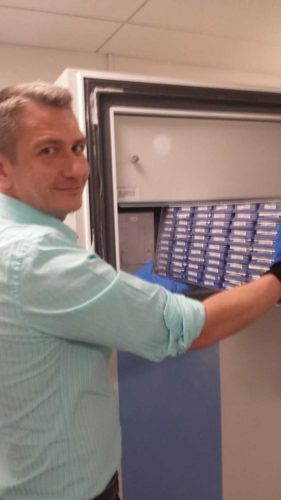 Under the International Barcode of Life project headed by Hebert, a database of DNA barcodes maintained at U of G currently contains records for 600,000 species worldwide. U of G’s new database and webserver for publishing the information online were developed by staff in CBG and in the University’s Department of Computing and Communications Services. For more details on the project, visit the CBG’s website.